In case you haven’t noticed, there’s two big trends currently taking the custom bike scene by storm: the re-emergence of the scrambler and limited-run customs by well respected workshops. Ducati and Triumph both offer off-the-shelf scramblers that do the style great justice, but simply don’t offer a great deal of performance. Icon Sheene and NCR, along with many others, offer limited-run machines that are truly remarkable, but you’ll need to sell your mother-in-law to afford one. 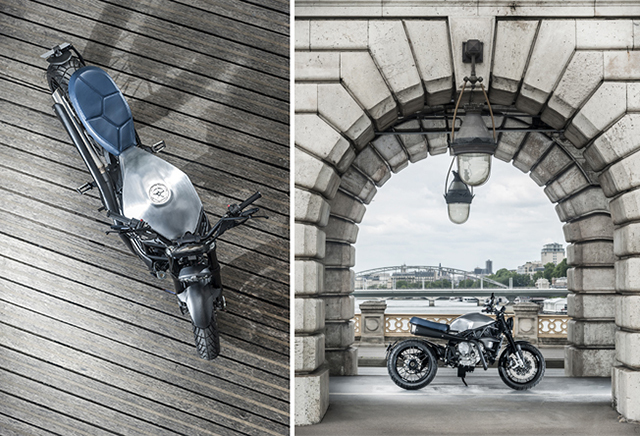 Now French company Viba Motor has entered the fray with an incredible one-off scrambler that has performance to burn and a mother-in-law friendly price to boot. 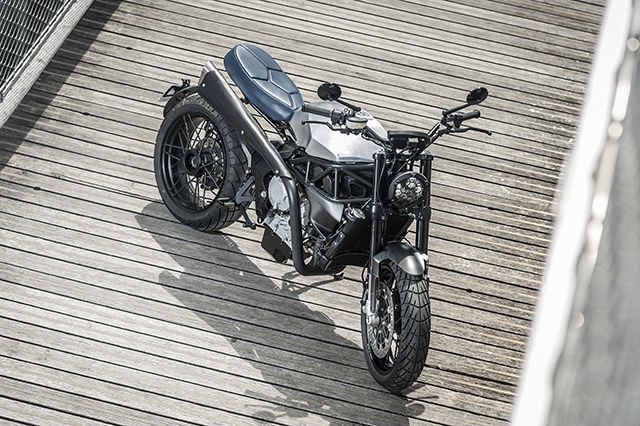 Yann Bakonyi is a designer by trade with his own successful company, but his love of motorcycles and in particular the Italian marque MV Agusta led him to create his new business venture,Viba Motor. 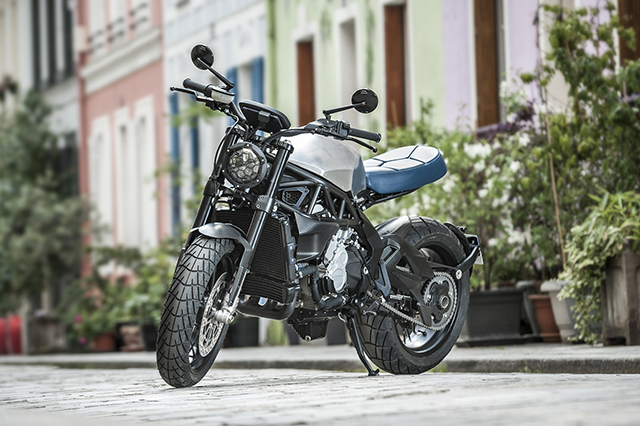 The idea was to start with a modern MV, design the bike in-house and have the work carried out in conjunction with a small team of the very best French craftsman. 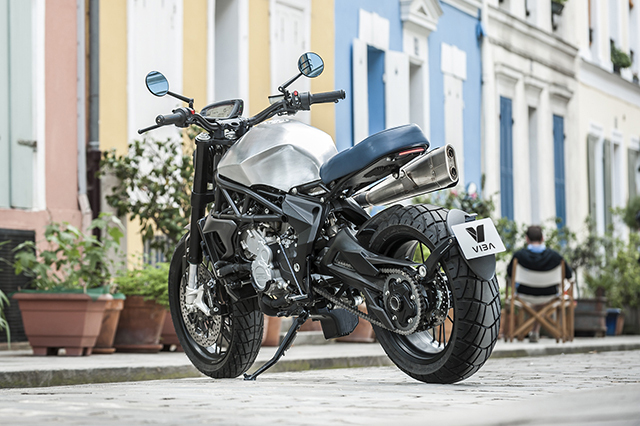 The result is Viba’s ‘Lara 800’ – an MV Agusta-based scrambler that ticks all the boxes and that will be a limited run production bike of just 23 exclusive machines. This is no base-model machine with dirt bike tyres but a new Brutale 800 – a bike that offers fantastic performance straight out of the box with the most agile of handling and all the best components and electronics the 21st century has to offer. With the design complete, a foam lab model was created to make sure all the ideas and inspiration would work together. And boy, do they ever. 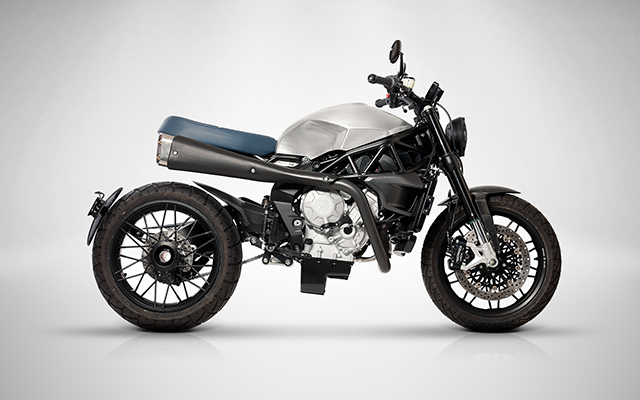 This is no subtle scrambler, either. Lara hits you in the face with radical body work that starts with a hand-made, one-piece Aluminium fuel tank finished in a matte clear to leave the best of the metalwork on display. 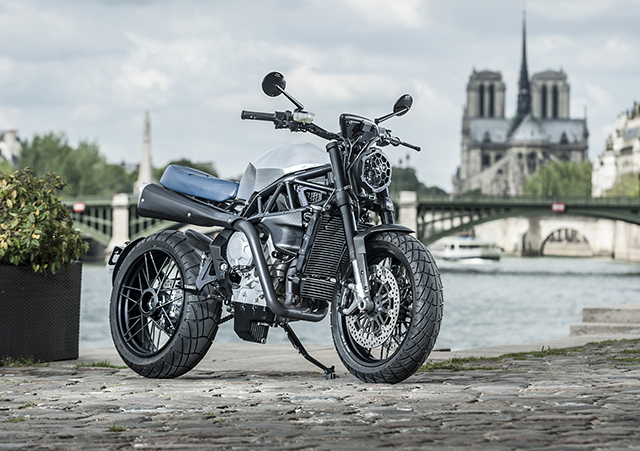 The seat is everything on a scrambler, and making it work just so required the fabrication of an all-new rear frame that supports an aluminium seat that is covered in expensive memory foam. It was then stitched and finished in a high-grade blue leather but, like many aspects of Lara’s build, customers will be able to stipulate the exact finish they desire. Thankfully, the bodywork that was once MV plastic has been ditched and replaced with minimal carbon fibre items that include both the front and (cleverly mounted) rear fender. There is nothing wrong with MV paint, but for scrambler-like durability, the frame and the triple trees have been powder coated in black. The Brutale is already a lightweight monster, with a factory 125hp and just 167kg to its name, but a good designer can always improve things. Along with the carbon parts, further weight savings were achieved by crafting the foot controls, risers and radiator guard from high-grade aluminium. The bulky MV headlight and surround is gone, and in its place you’ll find a scrambler-friendly cover made from Delrin plastic. Adding a little more pep to the MV triple is a custom, 3-into-1 powdercoated exhaust that is finished off with a more appropriately positioned Zard muffler. The grill of the air-filter has been 3D printed in a copolyester based carbon fibre composite, while Viba also upgraded the electrics, fitted LED lights all-round and powered the whole thing with a light weight lithium-ion battery. Not content with leaving handling to the already impressive MV stock offerings, the rear shock is now a purpose-built Elka item while the front forks sport an internal spring change to match the greater bumps a scrambler will invariably face. A Beringer front radial caliper further enhances the already impressive factory Brembo stopping power for those hard charging off-road sessions. The wheels are stunning, radial-spoked Borrani items which give the look of a scrambler wire wheel but in an exclusive style. Then comes the all-important tyres; 120/17 and 180/17 trail bike items. They’re currently D616’s, but the plan is to replace them with new Avon TrailRiders when they become available for the ultimate in modern scrambler rubber. The finished product is simply spectacular; it has all the items you would expect from a scrambler. A flat leather seat, minimal weight, a high-mount muffler and tyres to get the job done on and off road. But what makes Lara 800 so special is that it’s not just those items offered up as bolt ons. This is an exclusive, limited run production bike, designed and built by the best craftsman with the power to shred cobblestones and the handling to tackle the dirt, too. For 23 lucky customers, they will own a piece of Motorcycle history – one of the baddest and most ‘Brutale’ scramblers ever built. The only question left is will you be one of the lucky few?